Mike is a seasoned brass player who has performed in many varied venues throughout the world during his career. These range from concerts in Bogota Columbia with an audience of 150,000 and Madison Square Gardens, New York with audiences of 20,000 to recording studios in the UK and the Far East – and local bandstand concerts on Sunday afternoon, in the pouring rain, to an audience of one! An incursion into the Top Ten resulted in live television appearances during the seventies on shows such as Sunday Night at the London Palladium and Pebble Mill at One with the Band of the Black Watch. A traditional “Brass Bandsman”, his main instrument is tenor horn and he has performed up to Championship level with many bands, the most notable being CWS (Manchester) Band. Mike is a graduate of Salford who took conducting as his first study. Since completing his studies at Salford he has conducted in the UK, Belgium, France and Malta. 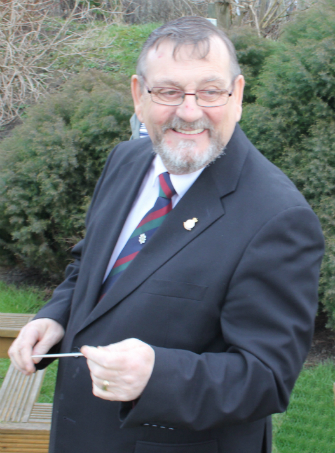 In July 2010 Mike retired from his brass teaching post with the City Music and Performing Arts Service in Stoke-on-Trent and is happy to concentrate on the progression of Trentham Brass, the training band and the beginners’ group.